Shares many similarities with Grand Theft Auto: Episodes from Liberty City in terms of its engine and performance. Extensive modding community, along with Grand Theft Auto: Episodes from Liberty City. See Downgrading. Ability to import your music for your own custom radio station. Rockstar has removed music from the game due to expired licences. Same with Grand Theft Auto: Episodes from Liberty City. See Restore Removed Music. GTA Modding - A wiki hosting mod information for the GTA series. Additionally uses SecuROM 7 DRM for disc checking. All versions require Games for Windows - LIVE and SecuROM PA DRM. [Note 1] Additionally, all non-retail versions require Steam DRM. Online features require Rockstar Games Social Club. Complete Edition includes Grand Theft Auto: Episodes from Liberty City. Change the value of "duration" for sections 1, 2, 3, 4, 5, and 6 to 0. Patch 8 updates the game to the latest version. The Steam version is already patched. Patch 7 is also available (may be required for some mods, as much as Patch 4). Since Patch 6 Rockstar Social Club is no longer required to run the game. Over 50 radio station tracks were removed from the game due to expired licenses in 2018. Downgrading isn't required to install this mod. Unpack to the installation folder. If GTA IV was downgraded to Patch 4, don't extract and replace the "common" folder, as doing so will mess up all text in-game. Merges songs from EFLC into the base game. Does not work with versions older than Patch 6. Configuration files are encrypted. For an alternative, see Command line parameters. %LOCALAPPDATA%\Microsoft\XLive must also be backed up as the save data is bound to the Games for Windows - LIVE profile. Cutscenes and loading screens are Vert-. 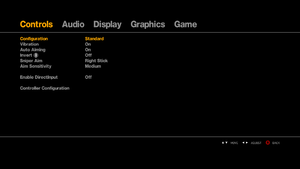 FXAA/MLAA can be forced through the Nvidia Control Panel/AMD Control Center respectively. Some problems like zoomed-in/out cutscenes may appear at high FPS. Simultaneous mouse and controller input available. If using a PS2/PS3 controller, you might want to change the Xbox 360 buttons to the PS2/PS3 buttons. In order to do so, follow the instructions below. Download the Controller Button Icon Change mod. -fullspecaudio: forces higher quality audio -minspecaudio: forces lower quality audio - good for low-end CPU's (e.g. radio cannot be heard outside car). Game uses DirectSound which can be handled by Creative Alchemy (set duration to 10), and possibly by IndirectSound (not especially DSOAL). Just run LaunchGTAIV.exe as admin in case of game crash. Official localization by «1C-Softclub» retail version, download. Social Club website stat tracking and leaderboards have been shut down. All other online features are unaffected. Game uses Games for Windows - LIVE. Make sure you are running latest version and refer to the concerning page if you have further problems. Right click on GTAIV.exe and enter its properties screen. Under the compatibility tab, set the compatibility mode to Windows Vista (Service Pack 2) and click OK. 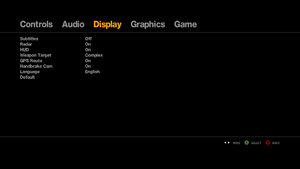 Under the compatibility tab, tick Disable fullscreen optimizations and click OK. Create a file named commandline.txt in your root installation folder. -reservedApp 0 is also worth a try for a 64-bit OS. Keep in mind that the use of High Textures is not recommended for 32-bit Vista/7 or newer. Forcing available memory with Patch 8 is not recommended as it will make the game unstable. Visible signs of this are R* startup logos ending up (slightly) earlier than the background music and overall gameplay accelerations like Niko moving and shooting (a bit) faster than normal. By default, recoil/bullet spread is only enabled when playing with a controller. This results in 100% shooting accuracy when using a keyboard and mouse. Not recommended to use in Multiplayer. If the game minimizes after selecting between GTA IV base and EFLC and can not be made full screen again it may be a problem with PunkBuster. It can be fixed by stopping it from running. Click End task to stop it from running. For video cards that have more than 2 GB or VRAM the game will run but won't let you change the graphics settings to anything better. In order to force the game to allow the changes, load the .exe with the extra parameter: -norestrictions. 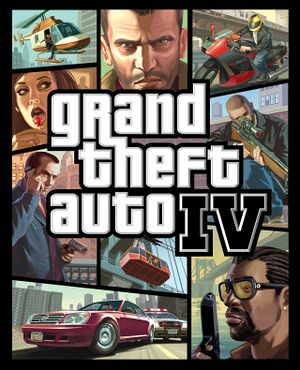 Right-click on Grand Theft Auto IV and select Properties. Press the Set Launch Options... button. Enter -norestrictions into the text field, press OK. Create a new text file in this folder and name it commandline.txt. Open it and add the string -norestrictions to it. There is a problem where the water loses its features and details after a while. Download the file waterTex.fxc located here. In <path-to-game> navigate to common\shaders\win32_30_atidx10\ and rename your original waterTex.fxc file. Drag and drop the file you recently downloaded into that folder. After the previous step has been completed navigate out of that folder and now to common\shaders\win32_30_low_ati\ and rename your original waterTex.fxc file. 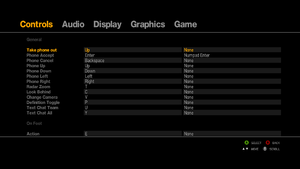 An invisible fonts glitch may occur which involves game menu text disappearing. Download the files fonts.dat and fonts_r.dat located here. Drag and drop the files into common\data\ in <path-to-game>. This is fixed in Patch 1.0.8.0. Open <path-to-game>\commandline.txt (create if it doesn't exist). 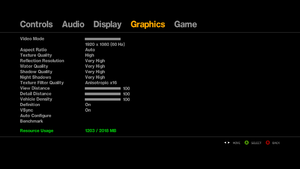 Put -availablevidmem 2 in a new line (or replace 2 with other number, it's a multiplier of already detected Vram by GTA IV engine). This was fixed with Patch 8. Restart the game. It should load up directly. You must have completed GFWL setup first, then you can take this shortcut. Currently Steam version users can encounter problems with disabling auto update feature. It can be done by setting time of update: 12 a.m. to 12 p.m.
Patch 7 has updated visuals, secondary keybindings, bug fixes, etc. iCEnhancer - Notable graphical enhancement mod. It is strongly recommended to make a backup of any files modifications may replace or amend in the event of corruption. Removes Games for Windows - LIVE service. Save games made using XLiveLess are not compatible with native save games. Disables access to the multiplayer to prevent cheating. Grand Theft Auto IV allows users to play their own music on a custom radio station, Independence FM. 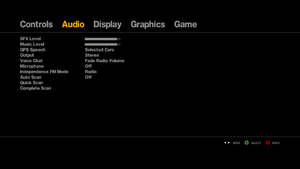 Simply place any audio files/folders or create shortcuts in the %USERPROFILE%\Documents\Rockstar Games\GTA IV\User Music\ folder, and tune into the station in-game. Supported formats are MP3, WMA, M4A. Other formats and extensions are not recognized. QuickTime or iTunes needs to be installed for M4A support. Use shortcuts to audio files/folders to save disk space and improve performance. Supports High-resolution audio files. Up to 96 kHz / 24 bit. Supports Surround audio files. Up to 6 channels. FLAC is not supported. Convert to WMA Lossless to use in-game. Monaural audio files not supported. By creating a file called commandline.txt and saving it to your root installation folder you can alter the way your game runs. If you are using Steam; go to the game in your library, right-click and click Properties, select Set Launch Options... and enter the commands separated by spaces. -noBlockOnLostFocus Don't block the window update when it loses focus. -usedirectinput Allow DirectInput alongside XInput support. Online play requires log-in to Games for Windows - LIVE. ↑ 2.0 2.1 File/folder structure within this directory reflects the path(s) listed for Windows and/or Steam game data (use Wine regedit to access Windows registry paths). Games with Steam Cloud support may store data in ~/.steam/steam/userdata/<user-id>/12210/ in addition to or instead of this directory. The app ID (12210) may differ in some cases. Treat backslashes as forward slashes. See the glossary page for details. This page was last edited on 21 April 2019, at 23:26.